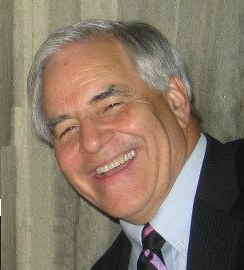 Twice a year, I look forward to the meeting of the UMS National Council Members, and each time I am struck by the leadership of Kenneth Fischer, the President of the University Musical Society (UMS) in Ann Arbor, MI. Leadership: you know it when you see it… However hard it may be to define, you know it when you see good leadership, especially in a domain like the performing arts, where success cannot be taken for granted. How often do you see packed venues for Amahd Jamal, the State Symphony Capella of Russia, John Malkovich, the Cloud Gate Dance Theatre of Taiwan, to name some of the 60+ performances scheduled for the 2011-2012 season? The obvious response is that you must have an amazing director of programming (Michael Kondziolka), and a no less remarkable marketing, education, and financial team (Sara Billmann, Jim Leija, John Kennard and many others). But you can’t forget the top guy at the helm, Ken Fischer, who has been the President of the UMS for 25 years. End result: although the organization is located in a rather small town, Ann Arbor, (around 120,000 inhabitants), the UMS is one of the top five presenters in this country. Wow! I will not define leadership, but I know why this 66 year old, white-haired, gentleman with sparkling eyes exemplifies some of the main characteristics of a leader. 1. Trustworthy: Year after year, Ken has been fulfilling his responsibilities without letting down anybody’s expectations, by empowering brilliant minds around him as well hundreds of volunteers, persuading donors of all sizes, reaching out for students, academia and business organizations, attracting a repeat audience enchanted by artists they often had never heard about — and blowing away world-famous artists unable to place Ann Arbor on the US map. Just how he manages this is hard to explain. The truth of the matter is that everybody trusts him and looks to him as a guide, likes his pastoral and pedagogical demeanor. 2. Empowering: The UMS offers over 60 performances each season, performed in up to seven University and community venues. To accomplish this goal, Ken has five direct reports and a total staff of only 30 people. No need to say that each person in the whole team must be empowered to deliver on such an ambitious program and leverage the amazing resources that Fischer has managed to focus on the success of the UMS: over thirty student interns from the University of Michigan, thirty-four board members and some 700 volunteers organized in multiple groups – Senate, Advisory Committee, UMS Choral Union, Usher Corps, National Council, Corporate Council, Teacher Advisory Group. Ken Fischer has empowered a whole tribe of believers and built dozens of links with regional economic development organizations and the University of Michigan. His credo is what his mentor, the late Patrick Hayes, founder of the Washington Performing Arts Society and founding president of ISPA, instilled in him. It’s an all-inclusive approach: “Everybody In, Nobody Out.” And it works! 3. Connected: Nobody can count the number of people that Ken Fischer knows – I mean really knows and passionately cares for, in Ann Arbor, of course, in the United States, and in the world. His memory of people and their personal history is downright flabbergasting. In addition to having a special talent for connecting with people, he empowers anyone to bring his/her network and welcomes friends of friends into the UMS fold, making even strangers feel connected to the community so that they want to communicate and spread its artistic message. 4. Effective: In the end, great leaders have a personal way of being effective — they are persuasive because they know what they are talking about and have an impact because they are contagiously emotional. Ken’s smiling friendliness, his soft-spoken manner and his almost conventional calm are the weapons of a man capable of filling many Ann Arbor venues with avant-garde artists and renegades that will be the classics of tomorrow – and shaking up the status quo without bruising feelings. Because of his considerable acumen, he continuously moves audiences forward, leading them through change – and making them enjoy today what many other presenters would postpone to a hypothetical tomorrow to play it safe. … And touching people’s lives is what the arts are about: Ken knows that in the arts, just as in technology, people do not necessarily know what they want, but are thrilled when you offer to them something that didn’t know they would enjoy. Year after year, and this for the last 25 years, Ken Fischer has built a history – a tradition – of innovation with one goal, offering audiences engaging experiences that they will remember and which, in turn, pave the way for more engaging experiences and more memories. Truly, you never know who you’ll meet at a UMS concert! One day they were students in Ann Arbor, and years later, they are big donors because the audacity of programming at the UMS reminds them of their own adventurous youth. It is impossible to talk about Ken Fischer without mentioning his family, as it is clear to anyone who talks to this proud husband-father-grandpa that they are the center of his broad universe: He is married to professional flutist Penelope (Penny) Peterson Fischer. Their son Matt is Director of the App Store at Apple and lives with his wife Renee Danielson Fischer and son Alexander in the San Francisco Bay area. 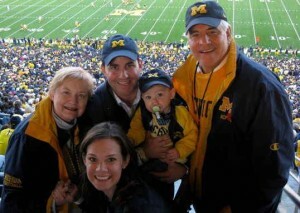 “Go blue” is the motto of everybody in this family!